The James Webb Space Telescope construction team doesn’t waste time! After hitting the halfway-point in December, they’re now up to 12 of 18 mirrors installed. Check out the livestream from the cleanroom for building this fantastic telescope now, or forever hold your peace! 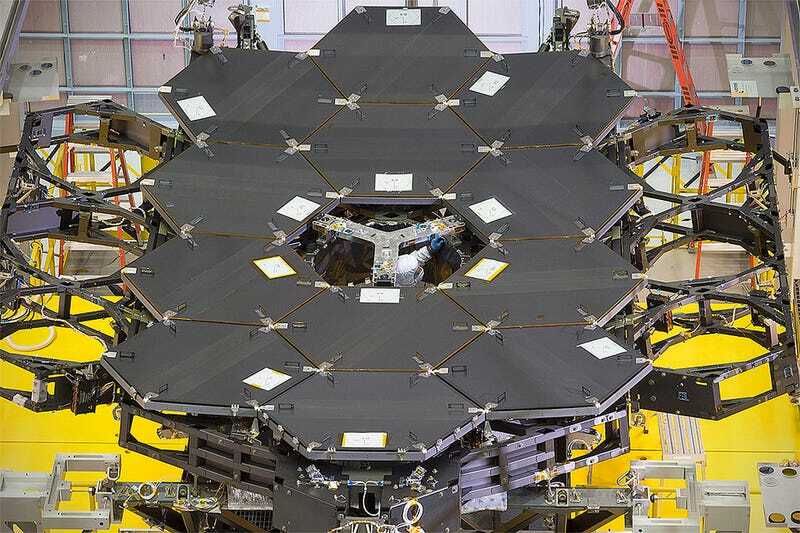 The 18 mirror segments will fit together to create a single 21.3-foot (6.5-meter) primary mirror. A secondary mirror and pair of tertiary mirrors round out the system. While the final diameters are merely respectable here on Earth, it is a colossal undertaking for a space telescope. A single mirror would be difficult to launch, so the engineering team developed this innovative plan to fold the segments up for launch and allow the telescope to blossom to full size once in space. That’s very, very impressive. As an added engineering challenge, the infrared telescope will operate at extreme supercooled temperatures, just tens of degrees above absolute zero. The mirrors are made of beryllium, a material selected for being stiff yet still light weight and stable even at cryogenic temperatures. The mirror substrate is nearly 2 inches (5 centimeters) thick with a highly-polished reflective front and a whiffled textured back. The whiffles look like a super-sized egg crate designed to spread the load and minimize distortion. The front surface was polished to an average roughness to less than a millionth of an inch (20 nanometers). Bare beryllium is a poor reflector for near-infrared light, so each segment is coated with a light dusting of gold vaporized on in a vacuum chamber. The mirrors are connected to actuators, a tiny system of precision motors and gears. Each mirror segment has six actuators to position it, aligning to shape the primary mirror so it can focus. These actuators are a brand-new invention just for the James Webb Space Telescope, allowing near optical perfection with near-nanometer adjustments. It seems like just yesterday the mirrors arrived in their customized individual shipping containers, and now assembly is almost completed. Congratulations to the engineering team, and we eagerly await celebrating that 18th and final mirror with you!